Still the mainstay of corporate and other commercial spaces, broadloom is the original product for wall-to-wall installations. We supply and install the full range of broadloom carpet from virtually every manufacturer on the market. Many technical and aesthetic advances have evolved and hybridized broadloom carpet over the last few decades, and Howard’s is committed to ongoing education to keep abreast with product developments. Particular areas of advancement include performance backings, recyclable fiber development, and paradigm shifts in color and pattern design. Commonly referred to as Carpet Tile, modular carpet is enjoying a huge surge in popularity for all commercial applications. As the user-friendly and modern design aspects of this product have been disseminated throughout the design community, an ever-increasing segment of the flooring market is captured by carpet tile. Howard’s has been a leader in offering this product to the design and building community and was a pioneer in early carpet tile development and installations. We are particularly familiar with the techniques and technical considerations associated with this popular product. The Hospitality market, which includes hotels, restaurants and clubs is a particularly important one in our Southern California region. Typically large-patterned carpet, and installation in high-traffic conditions make hospitality carpet a particularly technical specialty. Howard’s has installed every type of hospitality carpet from woven-Axminster to printed pattern pieces in the fast-paced environment just prior to opening. Particular care to a project’s budget and schedule are major concerns and the reason so many landmark hotels and other facilities have chosen Howard’s to complete their critical installations. Some of the oldest flooring applications, porcelain and ceramic tile are a specialty all their own. Longevity, durability and a broad range of styles from classic to modern to industrial make tile a truly universal choice. A solid technical background and thorough product knowledge make tile installation a true craft, as it has been for thousands of years. Our craftsmen are among the best in the business and have exercised their talents in many of the area’s best-known athletic, corporate, industrial and military facilities. There are few second chances with stone. As many and varied as the stone choices we offer are, there is a small and select group of Howard’s craftsmen who perform this most technical art. Cutting, honing and setting such beautiful and iconic material is a skill for the ages, and one we particularly enjoy. 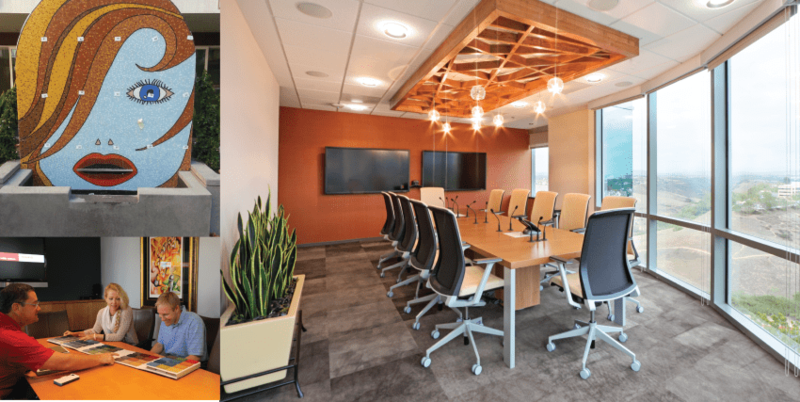 Large and renowned companies and facilities choose to make a statement by including stone in their space plans and we are committed to fulfilling their vision. The warmth and richness of wood and its technical cousin laminate are the primary reason for the their popularity. In recent years, industry advances have added durability, versatility and renewability to the list of reasons that designers and architects specify wood on so many projects. Wood flooring is as varied as the species of trees and grasses (think bamboo and wheat) from which they are produced. When value engineering is a priority, laminate products offer wood look at a reduced price point. Howard’s continues to offer and install virtually every type of wood and laminate product currently on the market. Comprised of Sheet Vinyl, Linoleum, Vinyl Tile and Vinyl Composition Tile (VCT) resilient flooring has been in service in locations as varied as storage rooms and aero space facilities. From medical facilities to retail spaces, school lunchrooms and corporate boardrooms, this family of flooring offers various technical features and almost every type of look imaginable. New products are released continuously and installation techniques advance in tandem step. Howard’s sponsors ongoing technical forums each month to keep pace with the evolution of this large and versatile segment of the flooring market. Over time, flooring products have evolved to be higher performance, lower maintenance and less porous. At the same time, the market has demanded that adhesives be less toxic with no volatile organic compounds (V.O.T). The result has been a general reduction in the tolerance that most flooring materials have for slab vapor emission. Vapor emission is a concern on almost structural concrete slabs, both on and above grade, and Howard’s takes care to virtually all flooring projects tested by an independent, ASTM-certified technician to determine the suitability and warrant-ability of an installation. In the event that a slab is found to be out of compliance with manufacturer’s specified tolerance for vapor emission, Howard’s has the products and expertise to prepare and treat these conditions, guarantee the success of the installation, and preserve the manufacturer’s warranty. Epoxy, stained and sealed concrete are found in applications as various as retail spaces, pharmaceutical clean rooms and industrial manufacturing. This type of seamless flooring is durable and sanitary, and can be customized to nearly any color design. Howard’s can install a variety of epoxy and stained concrete finished from broadcast quartz in a food service area, to stained concrete in a corporate lobby. Floor surfaces, both old and new can often be too rough, uneven or damaged to install flooring. With the proper products and skill, almost any surface can be filled, leveled, smoothed or patched to accept flooring and produce an attractive, durable, finished floor. No other company in San Diego can match Howard’s experience and expertise leveling, patching and skim-coating floors of all types for final installation. Many general contractors have used as to correct their slab conditions prior to even considering their finished flooring options. Raised access flooring has evolved from a cumbersome part of highly technical spaces to be a user friendly, convenient and even environmentally desirable component of virtually any space. Howard’s Rug Company supplies and installs a variety of raised access flooring to accommodate dynamic modular office, retail and technical spaces. Allowing for large amounts of voice, data and power cable to be run in re-configurable floor spaces facilitates lower construction and remodeling costs. These systems are re-usable, transportable and seismically compliant. As modular carpet, furniture, and wall systems become more widely used, so does access flooring continue to grow in popularity.